Today is Palm Sunday, the Sunday before Easter, and the last Sunday in Lent. These days, ever since I left the U.S. and stopped preaching, Palm Sunday sometimes creeps up on me unawares. Not this year, because I am paying attention, but in past years it has often caught me by surprise because I have been traveling for my birthday or the like. 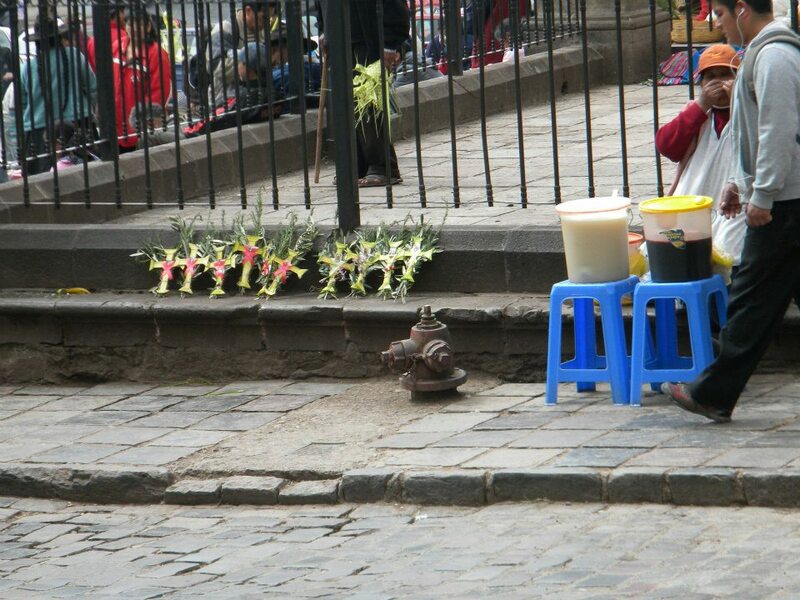 In 2012, for example, I was in Cusco for my birthday trip to Machu Picchu, and on the Sunday following I walked down to the center of town and came across dozens of women sitting in the street weaving crosses, crowns, and other decorations from palm fronds. Everyone in town was carrying palms of some sort, and there was a generally festive atmosphere. At midday there was a gigantic parade of church and civic groups before the town’s dignitaries with hundreds of onlookers all around the main square and side roads. The following year, again by surprise, I bumped into a local church procession in Buenos Aires near my apartment with congregants carrying olive branches and singing as they toured the block around the parish church. 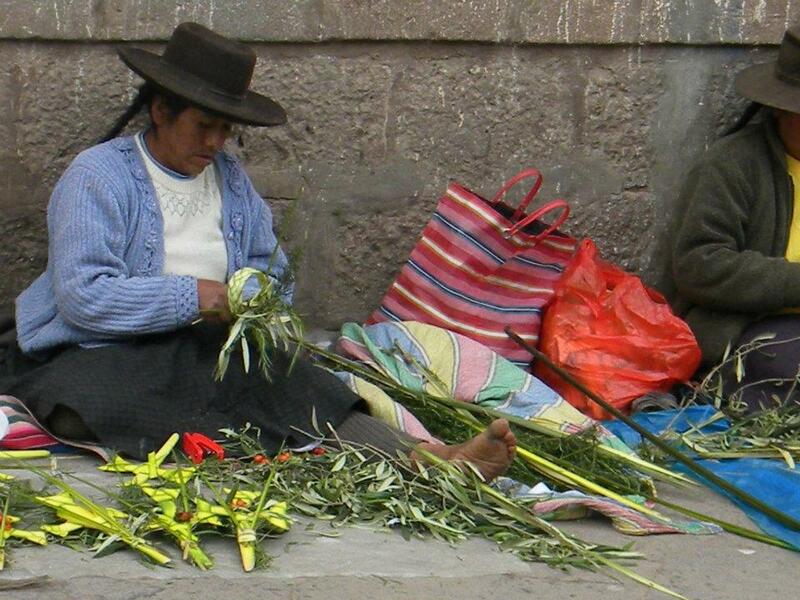 Palms are traditional in many countries because of the gospel narrative, but in quite a few places where palms were difficult to come by in the past, people carry, and wave, branches of olive, yew, box, willow, or other local native trees. Olive branches are standard in Rome and I believe that the custom was transferred to Argentina by Catholic monks from the Old World in colonial times even though palms are plentiful there. In fact in the gospels only John specifies palms. In the others they refer to “branches” and in Spanish this day is called domingo de ramos (Branch Sunday). The quotation at the end comes from Zechariah’s messianic prophecy (9:9), and the shouts of the people come from the Psalms (188:25-26), leading a great many Biblical historians to question the historicity of the event. Did this really happen or is this a wishful (theologically apt) construction of the gospel writers to make a point, underscoring their beliefs concerning the upcoming Easter events? Jesus proved himself to be the foretold Messiah, so he must have entered the city as a peaceful king as foretold by the prophets. The original Hebrew is poetry using the frequent Hebrew poetic device of duplication for emphasis. Zechariah is not saying that the king comes riding on a donkey AND a colt, but that the donkey in question is a colt, the offspring of a donkey. Duh !! The fact that the triumphal beast of burden is a donkey and not a horse is also significant. The horse as a king’s mount is a symbol of war; the donkey is a symbol of peace. It was not uncommon in the ancient Near East for people to spread clothes and branches in the path of a conquering hero. The specific identity of branches as palm fronds is unique to John. The palm was a very complex symbol in ancient times in both the Greco-Roman and Egyptian worlds which John was presumably familiar with. In the Roman Empire, which strongly influenced Christian tradition, the palm branch was a symbol of triumph and victory. It became the most common attribute of the goddess Nike or Victory. For contemporary readers of John, the procession would likely have evoked the Roman triumph, when the triumphator laid down his arms and wore the toga, the civilian garment of peace that might be ornamented with emblems of the palm. In ancient Egyptian religion, the palm was carried in funeral processions and represented eternal life. The palm branch later was used as a symbol of Christian martyrs and their spiritual victory or triumph over death. This juxtaposition of life, death, and triumph brings us back to the events of Holy Week. Palm Sunday kicks off Holy Week which is a bittersweet moment in the Christian calendar observed by Catholics, Orthodox, and many mainstream Protestant denominations alike (even those that are not especially keen on Lent). Holy Week is the climax of Jesus’ ministry when his role is made fully manifest. He preaches to huge crowds, performs miracles, and cleanses the Temple of moneychangers. He is both a hell raiser and pacifist bringing a new dispensation to the world. As such he is both praised and reviled: by the mob on the one hand, and by the Temple authorities on the other. The gospels cast the mob as terminally fickle, however. They are awed and excited by Jesus at the start of the week, and howling for his death by the end. 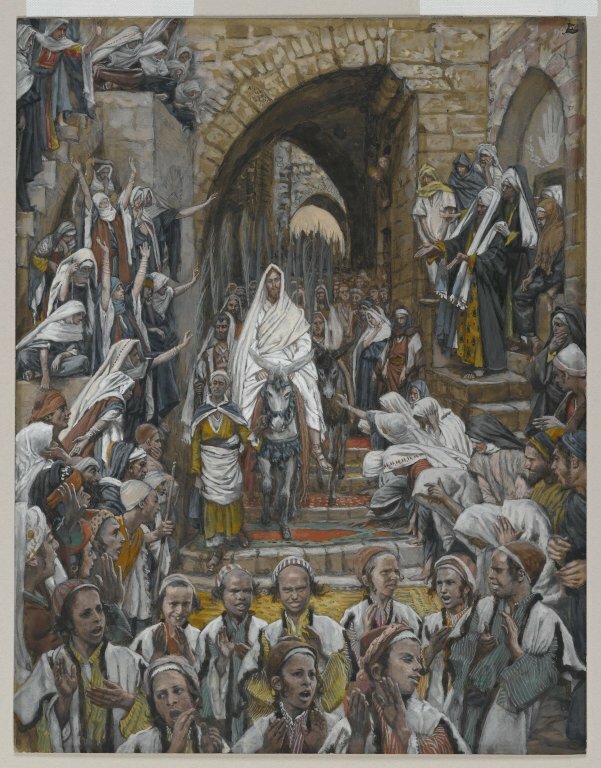 Jesus plays a cat and mouse game with the Temple authorities all week, openly preaching in the center of Jerusalem by day where he is kept safe by the crowds, but spiriting away in secret to the isolated suburbs at night where the authorities cannot find him until he is betrayed by one of his own. This is a teacher/preacher who has made a name for himself in the provinces but is now a grand celebrity in the capital and is making the most of it. Of course in Roman Imperial times this was an exceptionally dangerous game to play. The Romans were ever fearful of a Jewish uprising and there were many secret rebel groups bent on violent action. The Romans had no compunction in killing off ringleaders if they caught them. Scholars debate endlessly to this day as to whether it was the Romans or the Temple leaders who were responsible in actual historical fact for Jesus execution and I will have much more to say about this on Maundy Thursday. 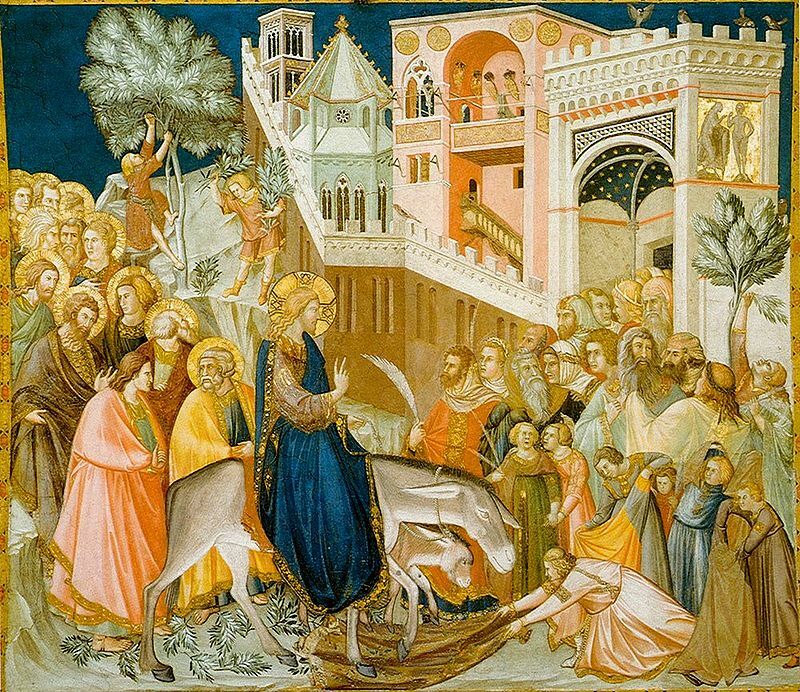 For now I will note that starting with the triumphal entry on Palm Sunday the gospel writers are setting the stage for a showdown between Jesus and the Jewish leaders, and the Romans are very much in the background, seemingly innocent bystanders. I suspect that the Romans were taking much more notice than they are reported to have been. 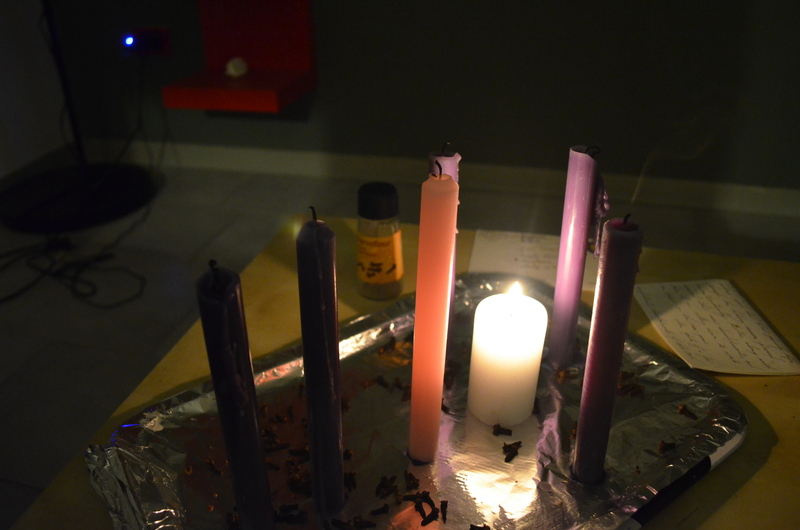 My Lenten wreath today has only the central Christ candle lit as a stark reminder that while the world temporarily rejoices, the light of the world is moving on to face his death alone. Holy Week was a very lonely time for Jesus despite all the hustle and bustle in Jerusalem. I will extinguish the Christ candle on Good Friday. 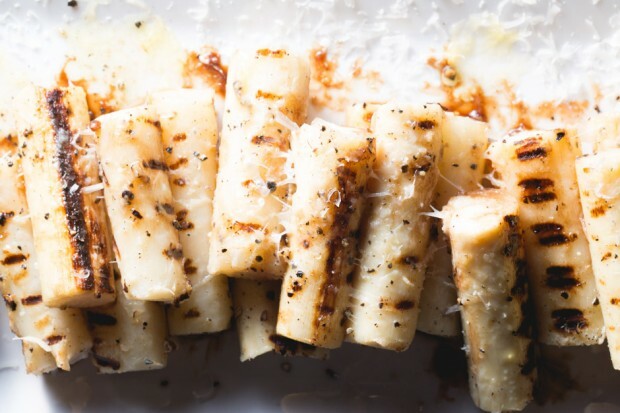 Hearts of palm are the obvious ingredient of choice for today. Heart of palm is harvested from the inner core and growing bud of certain palm trees (notably the coconut (Cocos nucifera), Palmito Juçara (Euterpe edulis), Açaí palm (Euterpe oleracea), sabal (Sabal spp. ), pupunha and pejibaye (Bactris gasipaes) palms). Harvesting of many non-cultivated or wild single-stemmed palms results in the death of the tree (e.g. Geonoma edulis). Some palm species, however, are clonal or multi-stemmed plants (e.g. Prestoea acuminata, Euterpe oleracea) and moderate harvesting will not kill the entire clonal palm. An alternative to wild heart of palm are palm varieties which have been domesticated as farm species. The main variety that has been domesticated is Bactris gasipaes, known in Ecuador as chontaduro, in Brazil and Costa Rica as palmito, and in English as the peach palm. This variety is the most widely used for canning. They are self-suckering and produce multiple stems, up to 40 on one plant, meaning that modest annual harvesting does no damage to the main plant. Another advantage that the peach palm has over other palms is that it has been selectively bred to eliminate the vicious thorns of its wild cousins. Harvesting is still a labor-intensive task, and thus palm hearts are regarded as a delicacy in many parts of the world. In the U.S. they are readily available canned and are not expensive. I always kept a can or two on hand when I lived in NY. 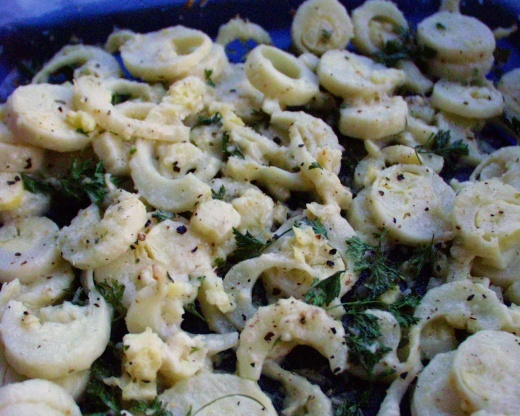 As is common, I used to use hearts of palm in salads, or on their own with a simple dressing. As a salad component the sliced hearts add some texture and flavor to a salad. They come packed in an acidulated liquid (typically ascorbic acid), so they can be a bit astringent. I used to like to drink the canning liquid but it may not be to everyone’s taste. It’s a lot sweeter than pickle juices which I know some folks like. Salads made with all crispy components such as hearts of palm, green beans, and asparagus make a welcome change from their leafy brethren. 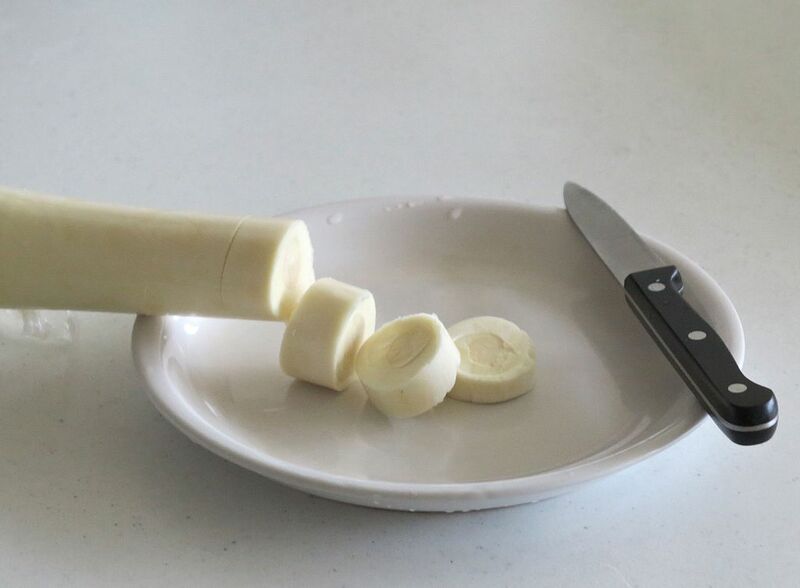 As a simple side dish for the day – dripping with Holy Week symbolism – I suggest plain hearts of palm dressed with the flesh of passionfruit. Hearts of palm can also be cooked. They can be plain grilled, or baked. In the latter case, slice them thickly then toss them with olive oil, finely diced garlic, chopped fresh parsley, and grated cheese. Bake in a hot oven until they are nicely golden.